We stopped by and visited with Nick Periut of Army of Tennessee Civil War Relics, who had a few jaw dropping, drop-dead gorgeous Confederate buckles on display. Ranging from the rare, state issued belt plates from Alabama and North Carolina, to plates that just scream cool, like the “CS” plate surrounded by 11 stars, representing the states of the Confederacy. 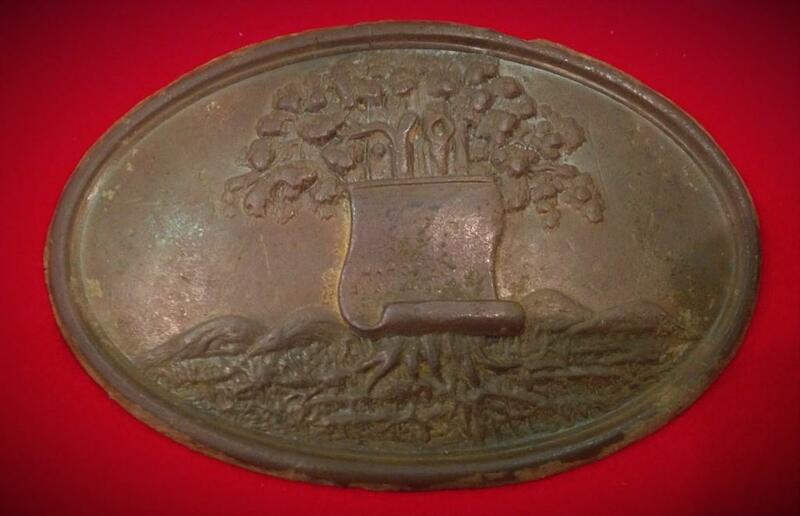 This buckle features the state seal of Alabama and was intended for use by Alabama units. Patterned after the Federal Regulation buckle of 1839, the buckle is oval and was designed to secure a soldier’s belt, worn over his jacket. Among other items, the belt would have been used to carry his cartridge and cap box. The detailed motif displayed on the face of the buckle depicts a map of the state, nailed to a tree, with prominently featured branches and roots. Most likely manufactured in the south by a small shop, the design was die stamped on a thin sheet of brass, with three brass hooks attached from a “T” frame imbedded in solder backing. Oval washers were then peened over two studs, covered with lead, and then brass caps were added. The remaining brass hook was bent toward the two studs. This buckle has a great backstory. In 1861, with southern patriotism at its peak, the young men of Orange County, North Carolina rushed to join the ranks of the Confederate army. Two companies of infantry were raised; one being the Flat River Guard, numbering 50 enlisted men. The guards were quickly sent to Raleigh and mustered as Company B, 6th North Carolina Infantry, under the command of Col. Charles Fisher. Fisher had been a member of the North Carolina Senate and president of the NC Railroad. A man of wealth, he supplied the regiment with many accoutrements of war and was likely responsible for the creation of the unique belt plate worn by the men of his command. 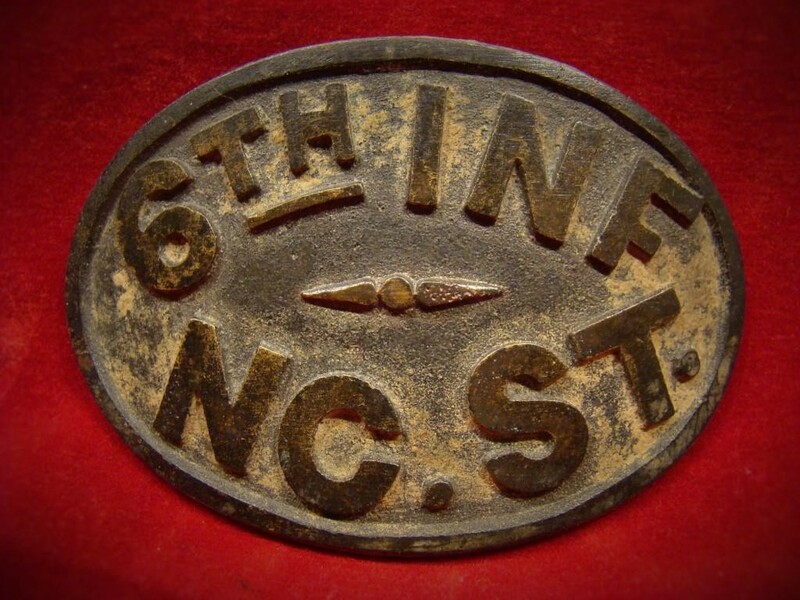 This extremely rare cast plate was manufactured by a railroad workshop at Burlington, North Carolina and depicts the NC state troops in bold letters. 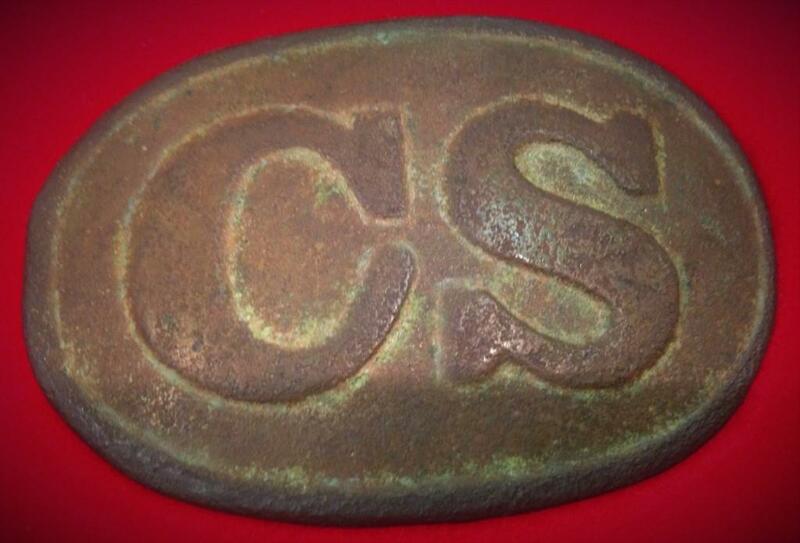 This crude oval belt plate depicts “CS” and was used throughout the Confederacy. The plate is most recognized for its simple letters weakly stamped inside an egg shaped design. The plate was stamped on sheet brass, with a rather primitive die. There is some debate as to who these plates were issued. 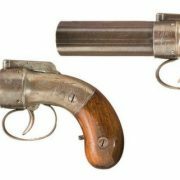 Some believe they were issued to Mississippi troops but could have been used by others. 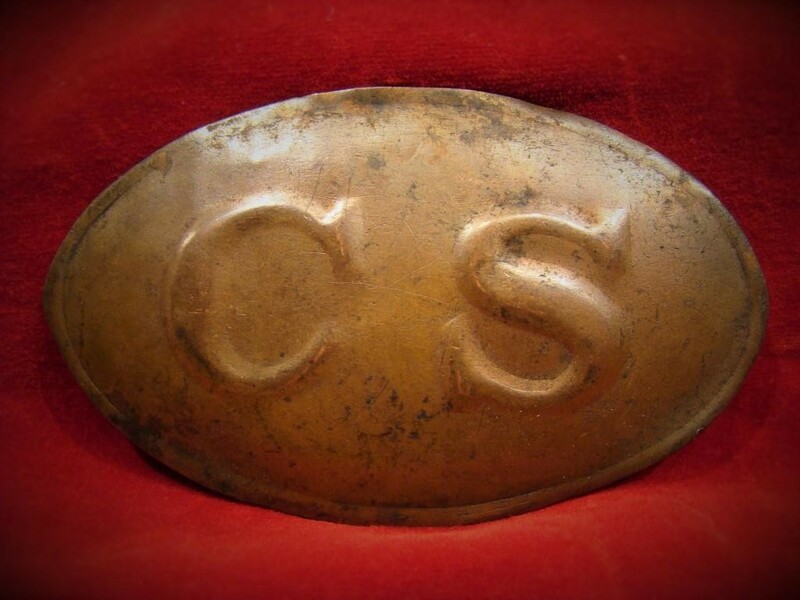 This oval belt buckle depicts “CS” and was broadly used in the Confederacy. Noted for its crude letters, the plate is referred to as the “Breckinridge” style. Many early relic hunters found this style plate in camps occupied by the famous John C. Breckinridge. However, this style plate has been recovered in areas not frequented by the general. The plate was stamped on thick sheet brass and scraps of brass were cut into belt attachment hooks and soldered into the back of the plate. The back of the plate was never filled with lead. According to Nick’s website, this plate was recovered near Thomasville, North Carolina in 2010. 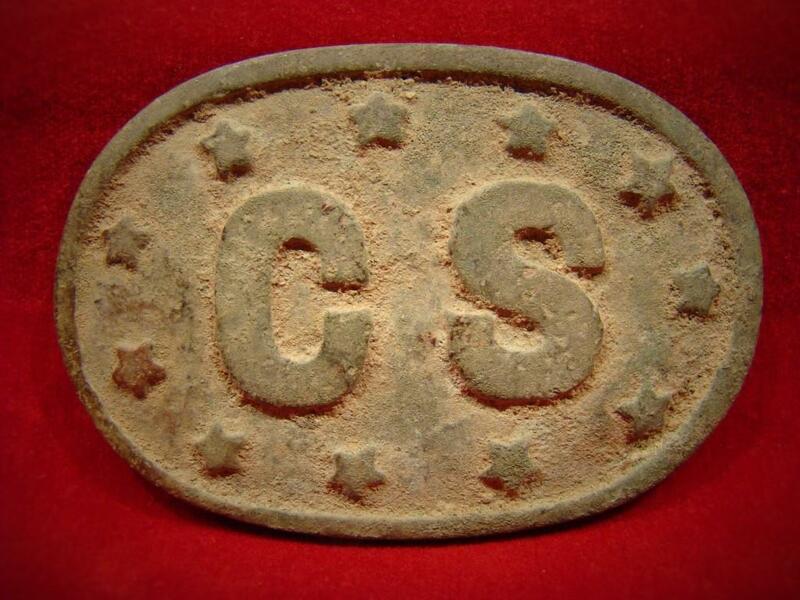 The buckle depicts the letters “CS” surrounded by 11 stars, representing the states of the Confederacy. These cast plates are noted for their poor workmanship, with nearly all of them having a casting flaw of some type. The quality of these cast plates varies from one plate to the next. Even if the master die was flawed, the rough castings it produced would have been milled and finished to remove the rough edges and visible flaws. This process introduced subtle variations between each plate cast. Another reason for variation between one plate to the next, is that production may have been shared amongst several small shops, with plates being manufactured from second generation master patterns. All of these casting flaws and variations present a major dilemma amongst collectors and appraisers. Counterfeiters have shamelessly exploited the casting flaws and introduced fakes into the market. For this reason, this plate style doesn’t come without controversy. Without irrefutable documentation of a plate’s origin, appraisers may not agree on a plate’s authenticity. 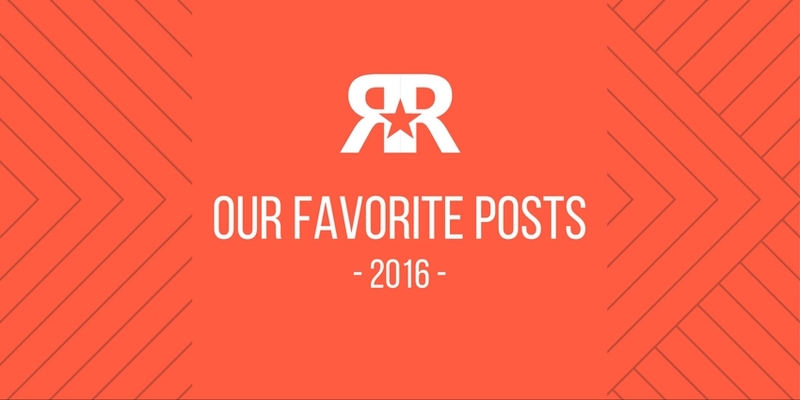 Relic hunter Joey Ready, stopped by and shared a few of his recent finds with us. 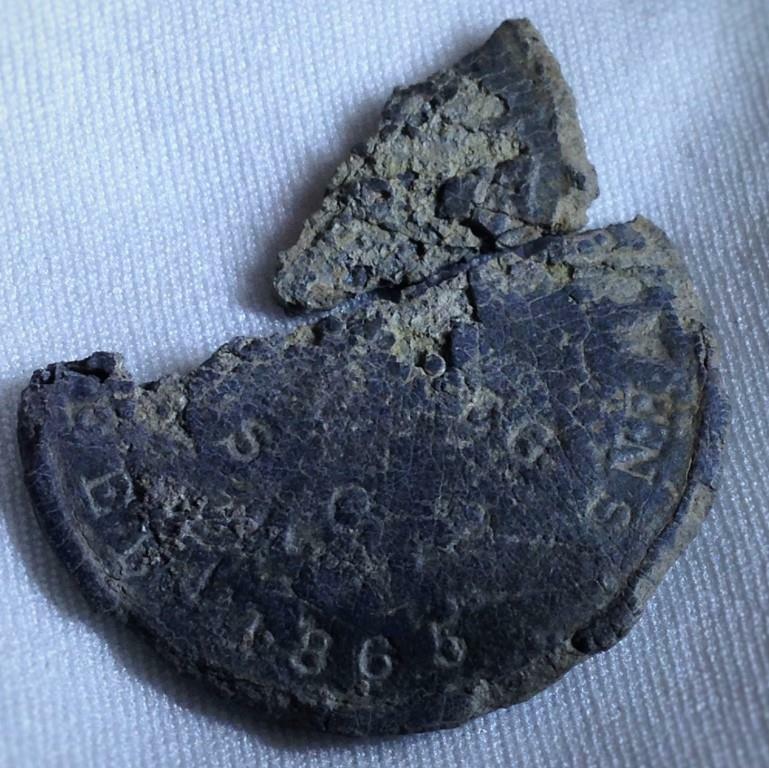 One artifact that caught our eye was what we believe to be a Confederate Dog Tag; found at a previously undiscovered Civil War hospital site near Washington, Georgia. Not surprisingly, during the Civil War, soldiers were concerned that their bodies would not be identified if killed in battle. Their concern was not without cause. Neither the Union nor Confederate governments issued ID tags at the outbreak of war. This led to soldiers making their own “dog tags” by etching their name or initials into the soft lead of their belt buckle or pinning a piece of paper or cloth with their name on it to the inside of their clothing. Soon enough, civilian merchants called Sutlers, satisfied the soldiers’ want for identification tags by adding them to the inventory they offered through their mobile tent stores. Most tags were manufactured by stamping designs and unique identifiers into a disc typically made of brass or lead. What makes this tag unique is that very few Confederate tags have been found. Typically, Sutlers’ sold tags to Union soldiers who often had more resources to purchase ID tags. 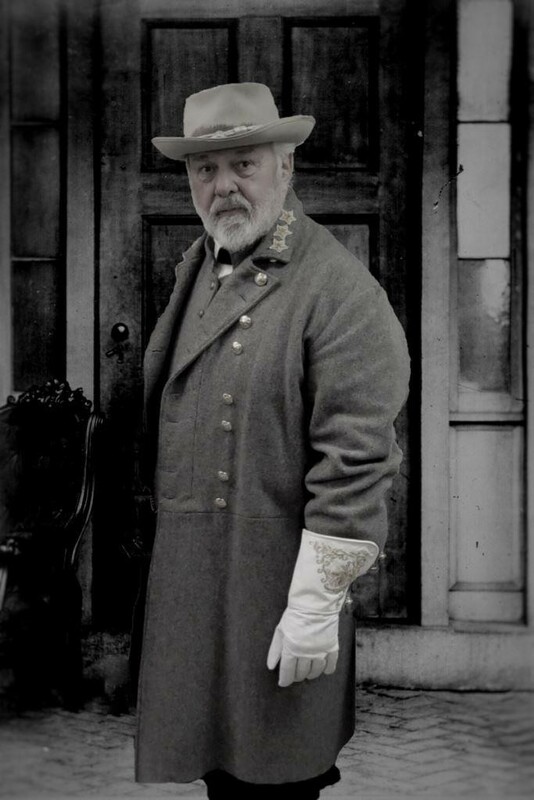 To my surprise and delight, I bumped into none other than General Robert E. Lee! 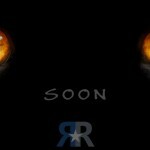 However, after some quick math I came to the realization that the real R.E. 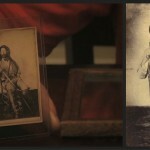 Lee would have been well over 200 years old, so I assumed the man that I was looking at was an imposter! Reenactor David Chaltas, shared his resemblance and deep knowledge of the legendary General with all that stopped by his table for a chat. I couldn’t resist mocking-up a photo of the General posed in the same fashion as one of the more iconic images of the real R.E. Lee. During the Civil War, bored soldiers often spent their idle time whittling on readily available material such as soft lead bullets. 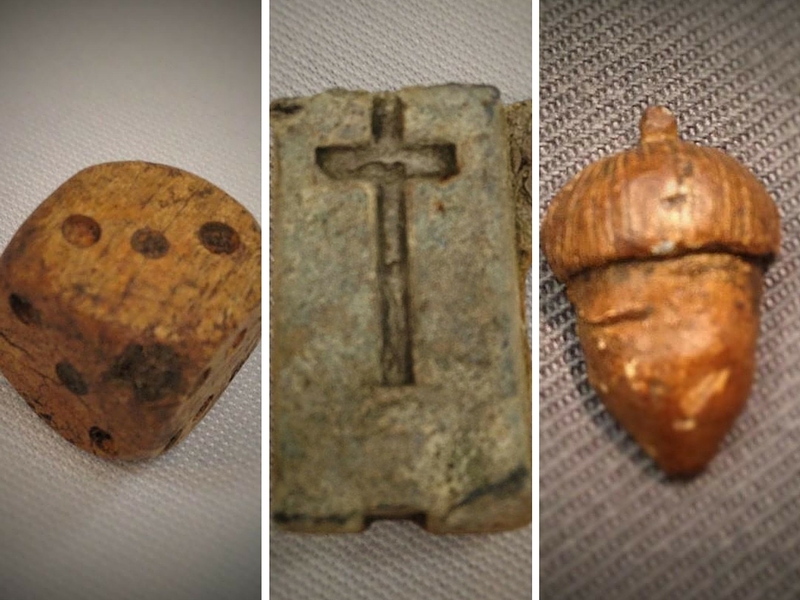 When searching Civil War camps, it’s not uncommon that one will recover chess pieces, fishing sinkers, pencils, and even plants and animals carved of lead. Previously mentioned relic hunter Joey Ready, had a few more goodies to share with us. Found in the same Civil War hospital site as the identification tag, Joey and his wife Kandi stumbled on a few interesting, hand-crafted items. 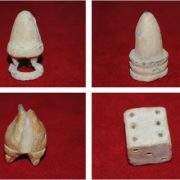 Previously featured in the November-December 2015 issue of American Digger Magazine, Joey showed us a dice made of bone. At a quick glance, nothing seemed unusual about the dice but upon closer examination, you’ll find that the numbers 5 and 3 were repeated twice. This would have allowed the gambler to beat the odds in a game of dice. What a cheat! Possibly carved by a wounded soldier recovering at the hospital, Joey unearthed a section of a lead bar used to make bullets with a cross carved into it. Two very different but equally interesting soldier-crafted artifacts. 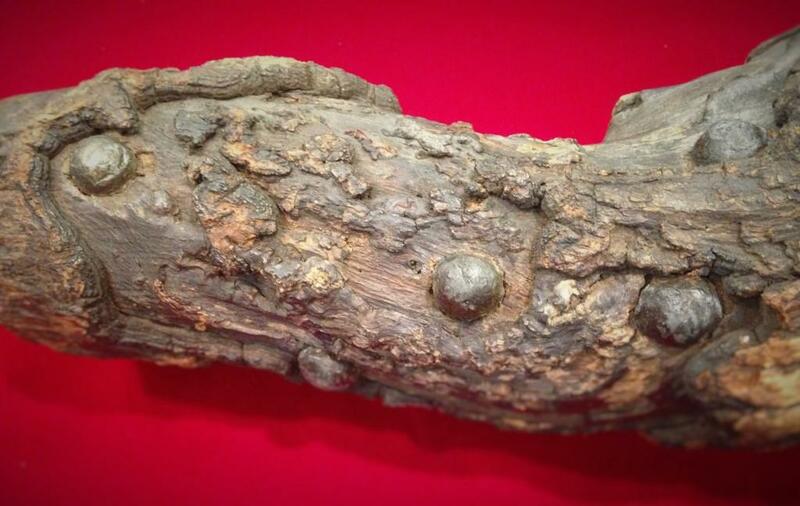 We also spotted a bullet that was carved into the shape of an acorn – possibly representing the 14th Corps badge. The acorn design was introduced in 1864 by Union soldiers who were forced to roast and eat acorns to prevent starvation after their supply lines were cut in Chattanooga by the Confederates. The acorn served as a symbol of soldier ingenuity and endurance. 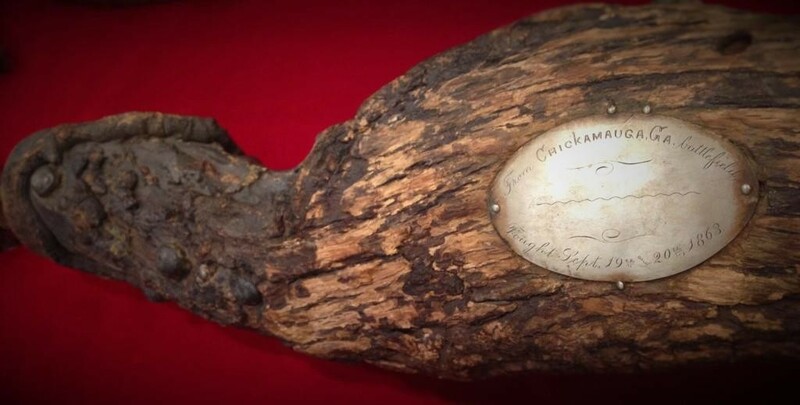 Back to Nick’s table (I wasn’t exaggerating when I said he brought some jaw-dropping artifacts to the show), where a “war log” recovered from the Battle of Chickamauga eerily rested on his table. Marked with a beautiful silver tag, this White Oak log was peppered with case shot and canister; bearing witness to the violence rained down on troops during the battle. For anyone interested in Civil War history and its artifacts, I would suggest making a trip to the upcoming Chickamauga Civil War Show in Dalton, Georgia. It’s one of our favorite shows to attend and I can assure you that you will not be disappointed if you decide to go. 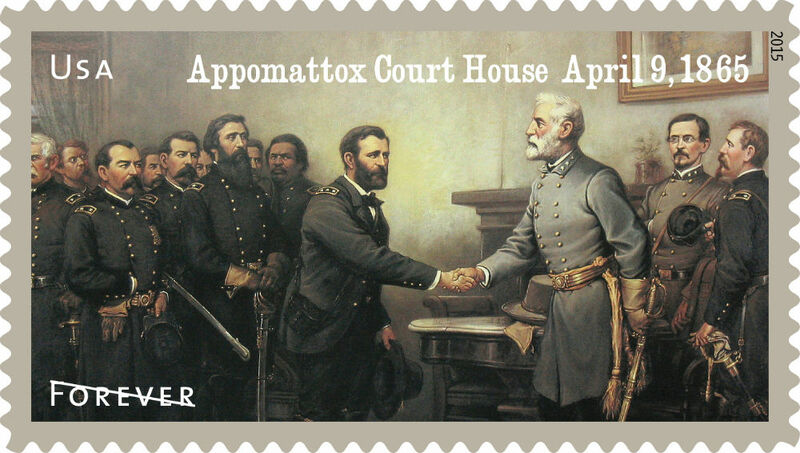 Lastly, make plans to attend next year’s South Carolina Civil War Show & Sale, hosted by American Digger Magazine!